I have collected some info bits about HoloLens that people desperately want to know. Even though the pieces are already on the Internet, most people including journalists don’t know where to look at. 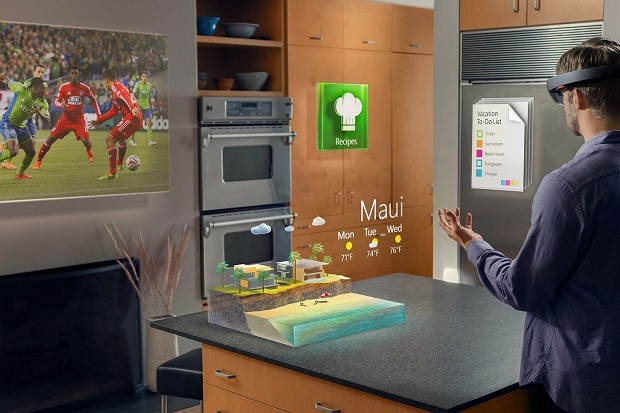 HoloLens is to be released toward the end of this year (2015). See ref2. HoloLens will “weigh about 400 grams, or about the same as a high-end bike helmet” at release. See ref2. HoloLens contains a Kinect camera(120×120 degree FOV depth sensor), a computer (a Cherry Trail CPU – see ref3, a GPU, a HPU – see ref4), a light engine, lens and vent. HoloLens is a stand alone PC that runs on Windows 10. HoloLens development kits (likely prerelease devices) will be delivered to developers in early spring. See ref1,2. NASA will use HoloLens for Mars missions starts July 2015. See ref5. HoloLens has only three buttons: one for sound volume, one for adjust contract, one for power.